"A great autumn recipe! Pork loin is roasted over a bed of seasoned sauerkraut. I serve this with baked potato and butternut squash. Other seasonings can be added to the kraut mixture, such as thyme or caraway seed." Heat vegetable oil in a skillet over medium heat. Season pork roast with salt and black pepper. Brown the pork in the hot oil, about 5 minutes per side. Mix sauerkraut, cream of mushroom soup, onion, apple, cranberries, salt, and black pepper in a bowl. 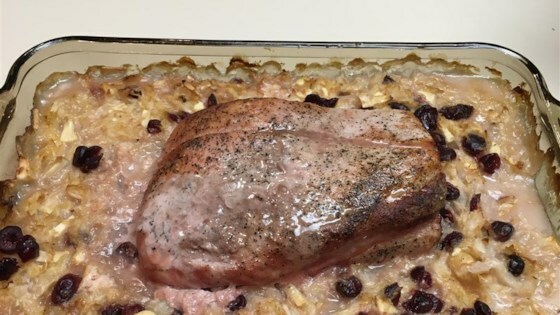 Spoon the mixture into a baking dish and place the pork roast on top of the sauerkraut mixture. Roast in the preheated oven until the meat juices run clear and an instant-read thermometer inserted into the center of the roast reads 160 degrees F (70 degrees C), about 1 hour. Remove roast and let rest for 10 minutes before slicing and serving with sauerkraut. I doubled everything, but I feel there was too much soup. If I make this again, I may omit the soup altogether as the family didn’t care for it too much. A really easy, tasty dish. Everyone raved on it, and said don't change a thing about it. It's added to my recipe box and I know it will become a regular at our house.